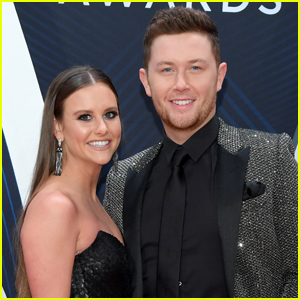 Scotty McCreery & Wife Gabi Couple Up at ACM Awards 2019 | 2019 ACM Awards, Gabi Dugal, Morgan Evans, Scotty McCreery | Just Jared Jr.
Scotty McCreery hits the red carpet at the 2019 Academy of Country Music Awards held at MGM Grand Garden Arena on Sunday (April 7) in Las Vegas. 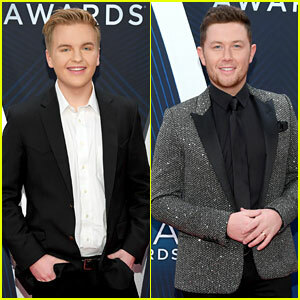 The 25-year-old “This Is It” crooner was joined by his wife Gabi. 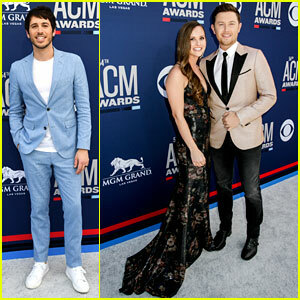 Also in attendance was Morgan Evans, who walked the carpet sans wife Kelsea Ballerini, who’s getting ready to kick off the Miss Me More Tour. Earlier that day, Morgan took a hike with some friends before getting ready for the big event. “Spent some time in the other side of Vegas this morn before the @acmawards tonight. It’s beautiful out there,” he captioned a couple of photos on Instagram. FYI: Morgan is wearing a Strong Suit suit, an Armani Exchange tee, Giorgio Armani shoes, and a Movado watch. 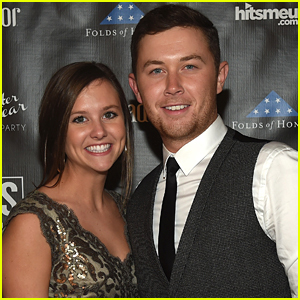 Scotty McCreery Marries Gabi Dugal in North Carolina!